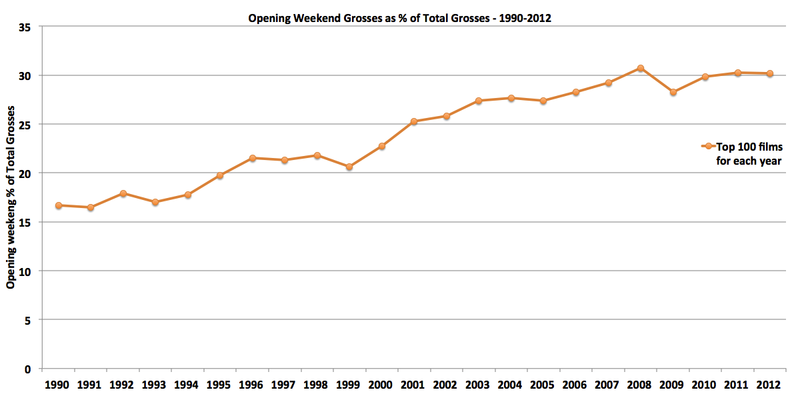 So the answer is yes – it’s true, box office has been shifting considerably towards the opening week (16% of total gross in 1990 vs. 30% in 2012). Another way to phrase this is: The second week drop in box office has almost doubled over the past two decades. 1. The penetration of the internet into US households, makes word-of-mouth easier to spread. Consequently, more films burn out quicker than they used to when bad movies could hide behind the smoke screen of difficult access to unbiased reviews. 2. Marketing teams learned how to deliberately get viewers to watch a movie before this word-of-mouth catches up with their advertising. 3. “Event releases” are becoming more popular because they are easier and cheaper to hype up and pressure fans into being the first to watch. Batman, Spiderman, Hunger Games, Twilight, Harry Potter, The Hobbit, etc. – all have pre-existing fanatic fan communities that rank their members by the amount of time they spend in the cold, waiting for a midnight premier. The easy thing to do would be to conclude that it is a combination of these three. But I never liked easy, which is why I was drawn to this hopeless industry in the first place. 🙂 Therefore, my next post will try to isolate the exact cause of this trend (I hope. I haven’t run the numbers yet).